With winter snow in the northern hemisphere, we tend to forget the heat that summer brings to the southern half of the world. It can get pretty hot down there. The Guardian reports that Australia is entering the third day of another terrible heat wave, remarkable not just for how hot it is, but how much of the country it covers: basically, all of it. This is the second killer heat wave to sweep across Australia this year. The memory is fresh of the scorching heat in early January, now it’s back with even more of a vengeance. On this particular issue, the science is in and it’s clear. Heat waves in Australia are getting more frequent, lasting longer, and getting hotter. This for a continent that’s already a pretty hot place, covered with extensive desert. A country on the brink of heat excess, is plunging in with worrisome speed. The science is also in, and clear, that the heat waves take a tremendous health toll. The increase in mortality (that means death) during these events is alarming, as are hospital admissions, and only those in deep denial even try to deny it. The daily high temperature ranged from 10.7°C (51.3°F) to 44.9°C (112.8°F). It can get very hot. It’s clear that all temperature above 35°C got more likely, and almost all temperatures below that value got less likely. Not only do we have overall warming, we have exactly the kind of notable difference at the extremes (i.e., the hottest temperatures) that makes climate change make heat waves into monsters. Again, the difference is obvious, with high temperatures more likely since 1985 than they were before. An advantage of the survival function is that one can compute reliable probable errors, which easily confirm that the difference is both sizeable and statistically significant. 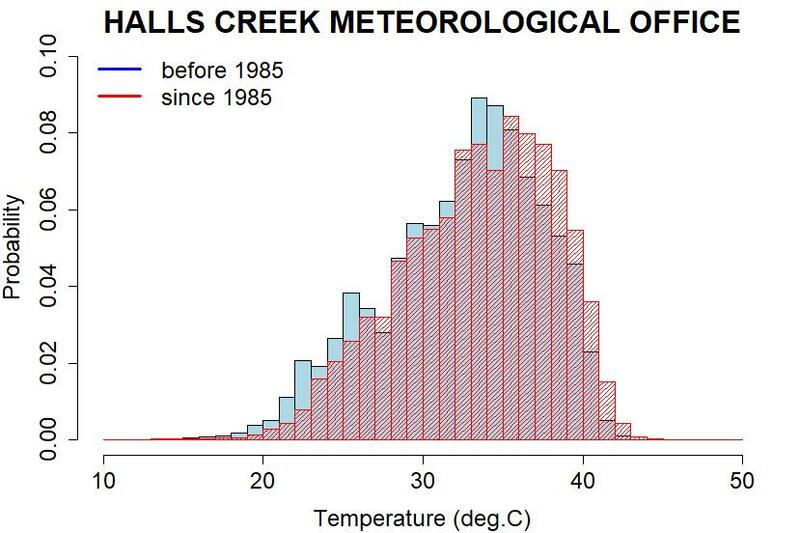 Yes, heat waves in Australia are getting hotter, happening more often, and lasting longer. Yes, the toll in human life and health dwarfs the economic losses, a huge as those might be. Australia is vulnerable to heat waves. We can help her, if we all do our best to limit future warming by eliminating carbon emissions. If we don’t, if the worst-case scenarios play out, I dread the heat waves that will plague our brothers and sisters down under. Reblogged this on Don't look now. Theologically speaking, Dante’s lowest (9th) level of Hell wasn’t, actually, hot at all. Generally speaking, we take his word for it! 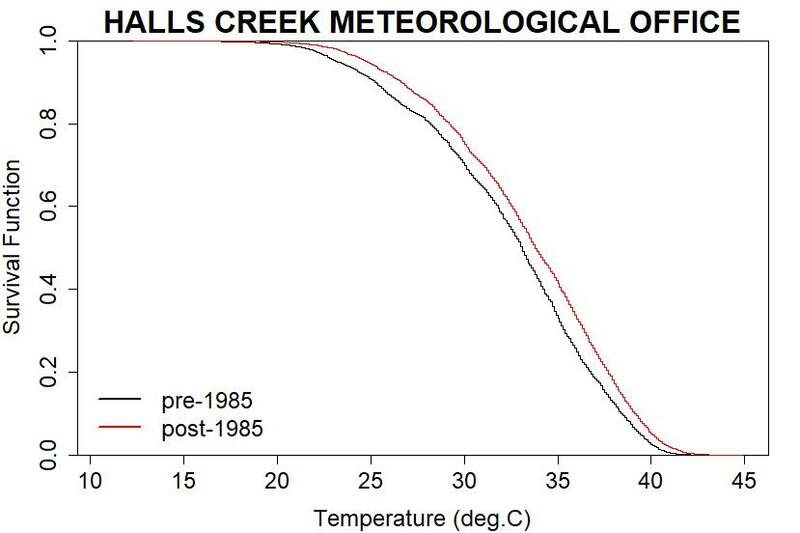 I took a geology field trip into the Outback (Kimberlies) in 1976, and it was too hot then (one day) to think straight, so I can sort of imagine how miserable it is now. Yes, the punishments are arranged by allegorical meaning, not temperature. –finally, the entire 9th circle consists of an enormous lake of ice into which sinners are eternally frozen in varying degrees. But no, Dante’s account has not been verified. Probably the ‘dark wood’ that was his entry point has been bulldozed for a parking lot by now. It isn’t only Paradise that gets paved. So much for “settled science”. Climate science can’t even decide if Hell is hot or cold. Here’s a /sarc if needed. WRT the fish kill, folks are blaming all sorts of factors but it’s interesting to note that both mass kill events this year have happen during heat waves. The second event is just starting. And, good news (not), the BoM tells us that the heatwave hasn’t peaked yet. Probably not a good idea to use Halls Ck, there is a reason no one (it’s a very small place and yes I have been there) lives there, it would be akin to using Death Valley as an ‘example’ in the USA, perfectly legitimate but crisitism will be inevitable. “Australia is in denial about climate change” . “Australians will have to adapt or die,” he said. Halls Creek is positively frigid compared to Marble Bar. Marble Bar hasn’t had a maximum daily temperature under 40 C since 17th December last year. The hottest it got in that time was 49.1 C on Boxing Day last year. There is a Halls Creek in NSW as well as WA. There are no links, so I will guess you are referring to WA. The hottest temperature recorded at that station was 8 Nov 1988 of 45 C.
That station’s recording only seems to go back to 1945. One big issue is that most of Australia’s wealth comes form mining – typically in the very hot areas… This will be huge issue for our economy in the coming years. Also, living in Perth, we seem to have missed this nasty heatwave. For whatever reason the heatwaves Perth suffers seem to be out of synch with heatwaves in the rest of Aus. I suggest renaming Australia to “southern scorched territory”. “southern”, becauses that leaves us with the option to similarly rename some area in the northern hemisphere when needed (and the need will arise eventually). Thanks for this Tamino. I had thought to bring Australia’s record heat summer to your attention but obviously there was no need. On top of it as usual. On the political side of things, our current conservative national Government seems to be unduly influenced by the fossil fuel industry IMHO. It consistently does the minimum it can get away with regarding curbing CO2 emissions. But an increasing number of conservative groups (eg the National Farmers Federation https://www.nff.org.au/submissions-search.html?subcategoryid=3650) are calling for stronger action on Climate Change, and polls are saying that even a majority of their usual voters want action on Climate Change. Then we have a record hot summer. The signs are that unless they make a radical change of policy direction on Climate Change action then they will no longer be in Government after the next election in 6 months (for other reasons as well). And there will be a lot of public support for good emission control strategies by their replacement. – hot and dry conditions in the lead up to summer led to extensive wild fires in the WINTER beforehand. That is NOT normal! On the statistical side of things, with an element of politics thrown in, the thought occurs as to what data is publicly available about official government warnings. Most Australian States have legislation for proclaiming high fire risk days as a day of “Total Fire Ban”. Where public use of fire outdoors is prohibited, so no camp fires for instance. And use of some farm and other machinery may also be prohibited due to risks of sparks. There may need to be some care taken in case the criteria for triggering a Fire Ban has changed over time. But an increase in Fire Ban days would show not just the Climate Changing, but obvious human impacts (more days when our activities are restricted). And at the following site various districts are regularly given a fire risk rating from low-catastrophic. If the data could be obtained then it may also show a statistical trend in the various risk ratings? Thanks again for your work Tamino. From an Australian regular reader. If you have to live in Australia then the best part seems to be Tasmania. Darwin certainly thought so. At one point he considered emigrating. 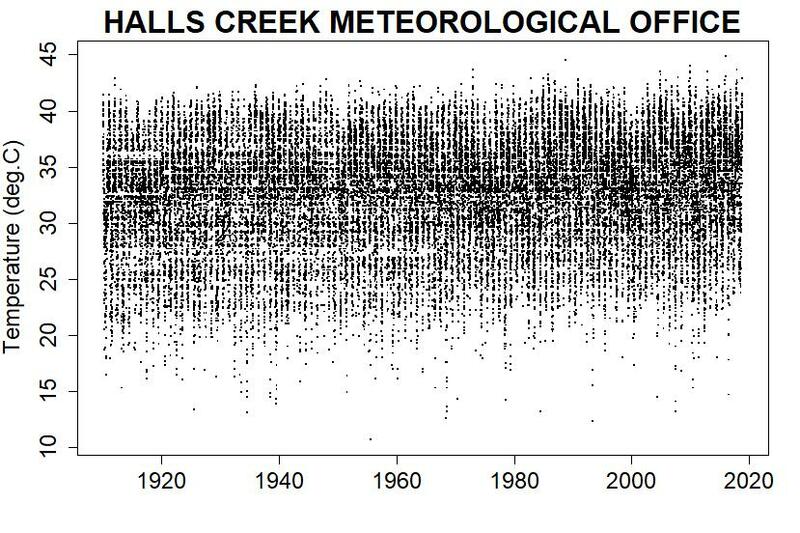 Of special note is the increasing wetter winters/springs in the west/south-west, with drier summers. The result is greater early-season growth that becomes tinder-dry in summer, with consequent vulnerability to wildfire. One of the first things that leapt out at me from the Tasmanian Climate Futures work around 2011 was the implied vulnerability of the South West Wilderness World Heritage Area to permanent alteration by fire. Since then there have been two notable large-scale blazes in that region, several decades before I expected to see such, and at this rate much of the cool temperate rainforest will be open bushland, grassland, or heathland by the end of the century. To expand on my previous post a little, the thing that makes Tasmania as potential disaster zone in summer is the heat that is depicted in the graphic at the top of the page. When it brews in this fashion it is fairly often blown off the mainland and onto Tasmania by the nor’westers I mentioned before, so by the time the air mass reaches the island it’s had days or weeks to accumulate heat. It’s not the relatively (compared to the mainland) mild climate for the rest of the year that’s the problem, it’s this extreme pattern of summer heat movement that smacks Tasmania around. Combined with the rain shadow over the eastern two thirds of the state, it can become impossible to manage in a conflagration – there’s a small population, a lot of fuel, not many fire-fighting resources, and little warning of impending disaster. This is just a sampling – there are many more Australian ecosystems that are pretty much going to be lost over the coming decades and centuries, and primarily to the direct impacts of climate change, and/or from climate change’s syngergy with other human impacts on the environment. Basically, humans are going to wilfully and with disregard for the consequences destroy the essential character of much of Australia’s ecology, and usher in the extinction of many further species in addition to what has been a catastrophic history of extinction since European colonisation. We’ve been told ad nauseum by biologists and ecologists for fifty years already, and more, that this is happening and we blithely ignore the science because “it’s the money stupid.” The destruction of our biological heritage is going to bite our nation on the collective bum when our population learns the hard way that humans are not divorced from nature, and that the laws of physics that will inexorably impinge on our life support systems. This map suggests that in a worst case scenario Australia would gain an inland sea, which you would expect would act as a moderating influence on heat waves. And whilst Australia waits the centuries for that amount of sea level to catch up and form those inland seas there will be lots more droughts and extreme heatwaves. Yeah there was an inland sea, but the future one will be super salty, like the Dead Sea. Assuming he was in the beginning, I’m guessing the owner of that pub in Adelaide is now no longer a denier! Yeah, the picture of the dead horses is pretty grim. I’d already seen that one; it was used in another story, linked above somewhere. Had to smile a bit at the frying egg picture, though; trust an Aussie or a Brit to chuck some tomatoes in there! And 49.5 C in Port Augusta in South Australia yesterday. Wow!